Shark Week Promo Is King. Posted on July 29, 2014 by Big Red	in TV Booty and tagged discovery channel, king of summer promo, shark week, shark week promos, tv, tv news. The Discovery Channel once more launched another genius promo for their forthcoming Shark Week in August. Their King Of Summer spot might just be their best yet. 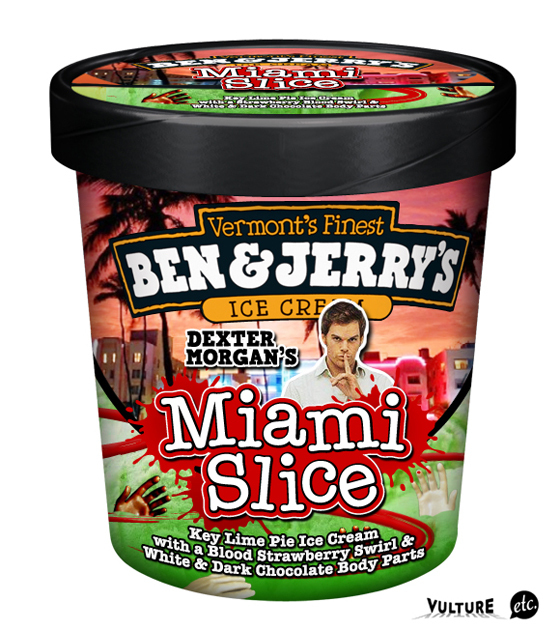 Posted on September 2, 2011 by Big Red	in Geeky Booty, TV Booty and tagged ben and jerrys ice cream, dexter, dexter morgan's ice cream, dexter tv series, graphic design, jon defreest, miami slaice ben and jerrys, tv. Jon Defreest is a fantastically talented graphic designer and artist whose love of movies and TV play a large inspirational role in his work. Above is his imagined tub of Ben And Jerry’s Dexter Morgan themed flavour of ice cream. If you want to see more of Defreest’s amazing work chart a course for HERE.